Similac® has the perfect product for your baby’s unique needs. 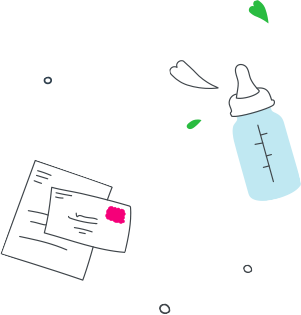 Find the right formula for your baby. Our promise is a commitment to giving your baby the best, and it has been for over 90 years. Breast milk is what’s recommended for babies. However, if you need to supplement breastfeeding or choose to formula feed your baby, you can feel confident nourishing your baby with Similac®. We also know that babies have different needs, which is why Abbott continues to give moms new ways to nourish their babies. Similac® offers a range of non-GMO* formulas, from easy-to-digest† to suitable for lactose sensitivity and soy-based, in different formats, so you can find the perfect choice for your baby at every stage. † Similar to other baby formulas. This non-GMO* and easy-to-digest† starter formula provides complete nutrition† to help support your baby’s normal growth and development. This non-GMO* and easy-to-digest† baby formula provides complete nutrition† with less iron than other Similac® baby formulas. This non-GMO* and easy-to-digest† baby formula is specially designed for babies who are sensitive to lactose. This #1 doctor-recommended† hypoallergenic‡ baby formula with extensively hydrolyzed protein is easy to digest§ and contains DHA¶ to support the normal physical development of the brain and eyes. † The extensively hydrolyzed formula most recommended by doctors. ‡ Hypoallergenic does not mean non-allergenic. § Similar to other baby formulas. This soy-based, non-GMO* baby formula is naturally lactose-free and enriched with DHA to support the normal physical development of the brain and eyes. 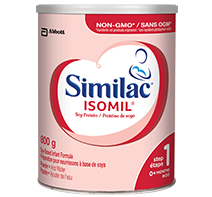 Similac® Isomil is the #1 soy-based infant formula in Canada. 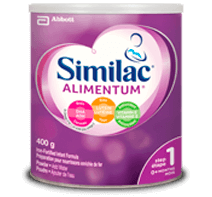 This soy-based and naturally lactose-free baby formula is non-GMO* and easy to digest.† Similac® Isomil is the #1 soy-based infant formula in Canada. This baby formula is specially designed to provide the extra nutrition preterm babies may still need to catch up on growth and development. This calcium-enriched baby formula for growing babies is non-GMO,* easy to digest,† and contains an exclusive blend of DHA, lutein, and natural vitamin E‡. This calcium-enriched baby formula is specially designed to support growing babies and toddlers 6-24 months of age. 12-36 months is non-GMO*† and contains an exclusive blend of DHA, lutein,† and vitamin E.
A nutritional snack or meal replacement that provides complete, balanced nutrition for pregnant women and breastfeeding moms.